When you’re a mom, whether that’s the parent of a newborn or the mom of older children, you always put your children’s needs before your own. While this is all well and good, being a parent doesn’t have to mean that you can’t take care of yourself as well, or that you shouldn’t make time to. A great way to make some time for yourself and your wellness is by taking up a ‘healthy’ hobby - aka something that aids your physical or mental health in one way or another. The question is, of course, how can you do that and what are the best hobbies for doing so? Below is a list to some of the hobbies that come with the best health and wellness benefits - read on for everything that you need to know. A simple way to help your mind and body relax is to practice pilates or yoga. These are both slow, gentle forms of exercise that are based on meditation and stretching, and are ideal for calming your mind while toning and conditioning your body. Studies have shown that both yoga and pilates can help women to heal more quickly after childbirth, as well as to help you to tone up and get in better shape. To learn more about postpartum pilates, have a browse of https://thebalancedlifeonline.com/postpartum-exercise-returning-to-pilates-after-pregnancy/. If you’ve never practiced yoga or pilates before, it could be worth attending a class to get to grips with the different stretches, and then learning to practice on your own each day. Can’t make it to class? Then how about buying a yoga or pilates DVD instead? Studies show that people who read regularly, not only tend to be more intelligent than people that don’t, but also that people who read also tend to be less stressed out. This is because reading is a relaxing activity, it allows your mind time to relax and switch off from the stresses and strains of everyday life. Parenthood is no easy task, which is why reading can be such a beneficial hobby to have. To make reading more affordable, consider taking part in book swaps like the one from http://stay-a-stay-at-home-mom.com/paper-back-swap.html. Book swaps can be great, as sometimes they introduce you to authors and titles that you would never normally have known about. If there’s a book group in your community, perhaps you could also consider joining that? Or, how about a virtual book group instead? Discussing a book with other reading lovers can be a great way to share your thoughts and feelings about a plot. The adult coloring craze has swept the nation in the past few years, with more and more adults taking it up, and it’s easy to see why. 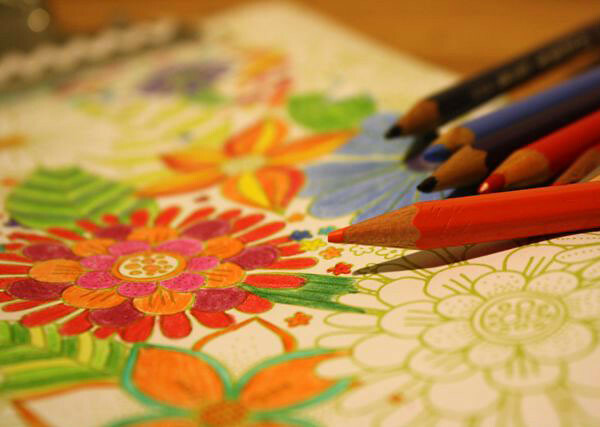 Adult coloring is a highly therapeutic hobby and one that can offer an incredible way to relieve stress. If you want a hobby that you can pick up and put down whenever you have a spare moment, adult coloring is it. It’s a fantastic way to use your spare time as it will help to relax you and relieve any stress or tension that you are feeling. Adult coloring is a form of art therapy that many therapists suggest for people with high levels of stress, or mental health problems like anxiety and depression, as it’s a fantastic outlet. There you have it, some hobby ideas that will help to give your mental and physical health a boost.